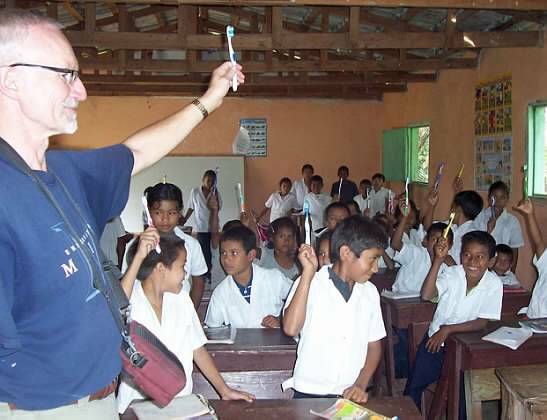 The August 2013 NY/HELP trip to Honduras had four participants: "Profesor Jeff" Mason, "Dr. Gordon" Comstock, Ginger Comstock (all from the Arcade United Church of Christ), and translator Dan Beyer, whose family attends the Tabernacle in Orchard Park. NY/HELP's mission for this trip was "meetings." After a number of preparatory meetings here in New York, we arrived in San Pedro Sula, Honduras on Saturday, August 3. At the airport, we were met by Yovany Munguía, our coordinator in Honduras, and later met the pharmacists at the SuperFarmacia Simán in SPS, where we arranged for medicine orders to be sent to the clinic in La Laguna. Sunday involved riding the "Directo" bus to Yoro (with our bags piled on top), where we stayed at the Hotel Marquéz, the best hotel in town (at $30 a night for a double room!). There we met our old friend Bill Briggs, who, along with his wife Susie, was a main founder of NY/HELP in 1989. 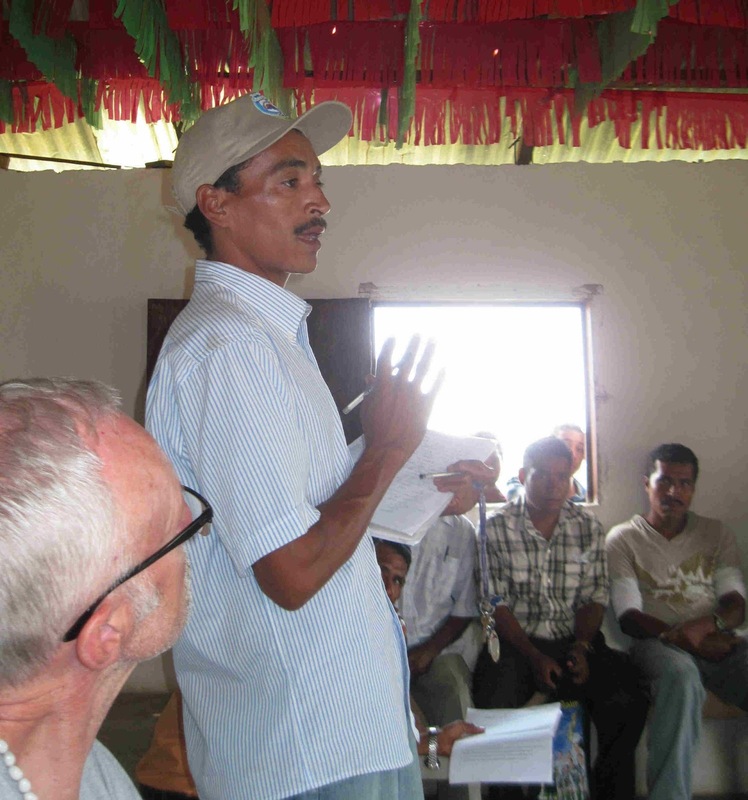 Bill now directs Honduras Hope, which is working with several Indian communities on the far side of Yoro. 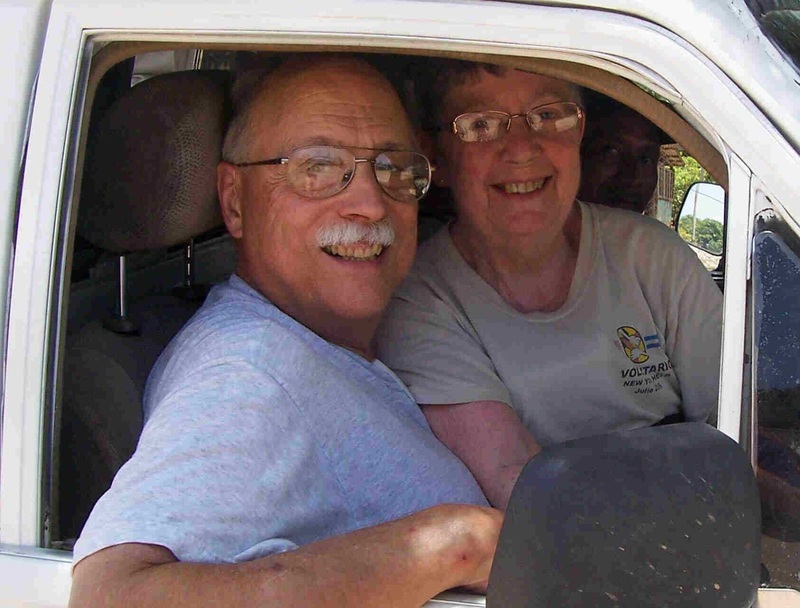 He gave us some useful advice, and drove us to the "Student Boarding House," where we reunited with our old friend Petronida, the "house mother" there, and her husband Pastor Jose Feliciano. Following was a short visit to Plan Grande, an Indian community about an hour's walk from the city of Yoro, where we had interesting discussions with several students who live there. Monday, Yovany joined us at the hotel, where we met with a delegation representing the Tolupán tribe of Mataderos ( the indigenous people in the twelve villages around La Laguna). Those present included Antonia Amaya, President of the Tribal Council; and Jorge (Joel) Ramirez, president of the Tribal Development Committee. We had a second meeting on Thursday, held at the Catholic church in La Laguna, where 36 representatives from the Patronados of the twelve communities on the mountain were all in attendance, along with us four NY/HELPers. Also attending was a representative from FETRIXY (the umbrella group for all the Tolupán tribes of Yoro). Yovany was there for most of the meetings. He is highly respected by the community, and helped to keep discussions on track and to summarize the conclusions and suggest plans of action. The meetings were chaired by Joel, who demonstrated excellent leadership skills. The agenda for these meetings covered a half-dozen points. These included discussion of the organization, goals and work plans of the Tribal Council, including plans for workshops for the community leaders in basic accounting, planning skills, and organizational principles. The discussion then turned to ways to improve the organization and maintenance of the Medical Center. A Health Committee is to be formed, which will manage the affairs of the clinic and support the nurse in her efforts for the next year. The committee will also investigate sources of outside support for the clinic. At the end of a year, this committee will be re-evaluated. We also discussed ways to improve the clinic's outreach to the various rural communities. 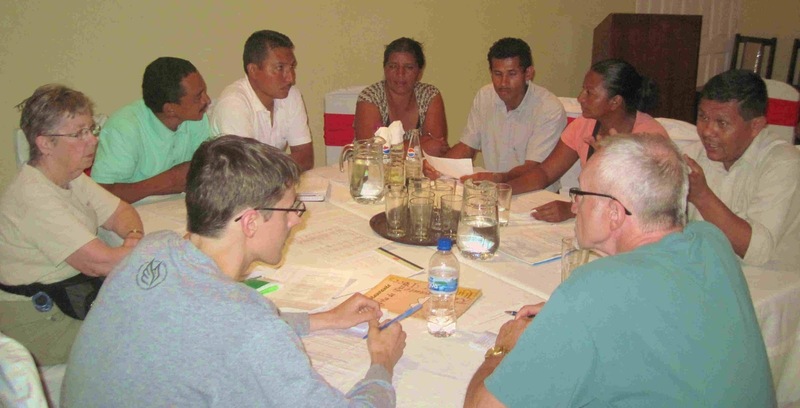 The Tribal Council and Development Committee plan to obtain more information about the conditions in the various communities, and to use this as a basis to select community projects. NY/HELP will use these recommendations as the basis for the projects we will support. This information should help improve the welfare and living conditions of the families in the communities. Training to meet family needs such as natural medicine, public health, nutrition and education is to be a priority project for the committees. Finally, we all had a spirited discussion about ways to improve student attendance at the new Centro Básico (middle school) which was recently built (with NY/HELP assistance) in Mataderos. The school currently is less than half full, due partly to the distance many potential students would have to walk (and climb!) to get there. The committees will be looking into ways to promote the Centro Básico in the communities. NY/HELP will continue to support these efforts as best we can. In between these meetings, on Tuesday we hired a pickup truck to take us and our supplies up to La Laguna – this turned into a VERY cosy three hour trip! We also had some time for our usual projects. 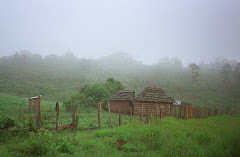 On Wednesday, Jeff and Yovany walked miles to visit the schools down in the valley on the other side of the mountain. They visited the schools in La Kiloma and El Paraíso, and saw the site for the new Kinder (kindergarten) building that NY/HELP wants to help construct in La Kiloma. Thursday, Jeff, Dan and Ginger visited the two schools in Mataderos. They planned to visit the La Laguna school on Friday, but it was closed as one of the teachers was ill and the other teacher was away on school business. Gordon stayed in the clinic, and, working with our nurse Mirtila Garcia, saw 54 patients. He had invaluable assistance from Dan, who has turned out to be a superb medical translator! And Ginger took lots of pictures for our reports. We felt safer in the clinic, surrounded by friends, than in San Pedro Sula, which unfortunately has a high crime rate. We had delicious meals at the clinic, often with Aracely's delicious vegetable soup, made from local produce. In the city, we were introduced to baleadas, tortillas stuffed with refried beans, cheese, and eggs. Friday we walked down the mountain. Arriving in La Habana, we caught the "Directo" to San Pedro Sula, where Yovany met us at the bus terminal. Saturday morning, we had a final meeting with Yovany, and developed a contract with him to cover his duties and responsibilities as our NY/HELP coordinator in Honduras. He will be paid $150 a month, less $50 to go toward his debt to us. We feel this is our best path, as Yovany has demonstrated his concern for the people of the tribe and his ability to get everyone to work together for a common purpose. Several months ago, we found out that Mirtila had not been paid her salary for the past year. In spite of that, she had kept the clinic going. 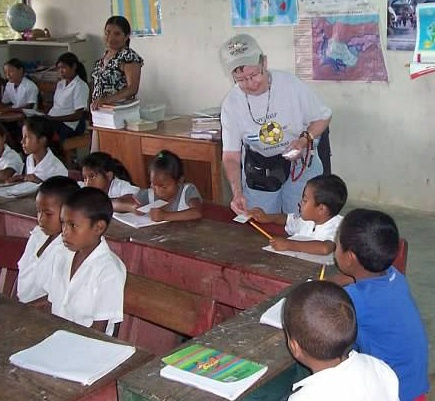 Prior to our trip, we purchased MoneyGrams to be sent to Honduras for her last year's salary of about $3600. We are now making arrangements to pay her by MoneyGram on a quarterly basis. Sunday, August 11, gave us an uneventful airplane trip back to Buffalo. NY/HELP owes its existence to the grace of God, and to the work, donations and prayers of all of you. Muchas gracias!